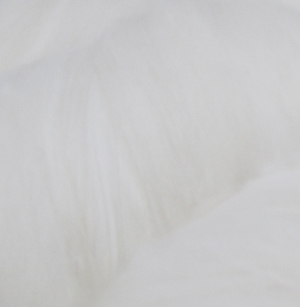 ﻿ Mongolian Cashmere fibers from Weaver Creek Fibers, wholesale purveyors of luxury fibers. This delicious fiber from goats raised by herders on the steppes of Mongolia comes in two colors; cream (a soft beige) and light brown (a slightly deeper beige). Both colors over-dye magnificently but are beautiful in their natural colors, as well. This is the beautifully soft downy undercoat that keeps the goats warm and will be a favorite for spinners and the final end consumer. As with all cashmere and cashmere blends, we recommend that the spinner introduce plenty of twist into the singles and plies, to create a springy and durably buttery yarn. Our cleaned, dehaired and combed Mongolian Cashmere top is available in cream light beige. The staple length is 2.08 inches (52mm) and has an approximate micron of 16. It is also available blended with Merino and Merino/Angora. There is no fixed breed of goat that is biologically named cashmere, but instead in the down that can be found in 68 breeds of goats found in 12 different countries. Most cashmere comes from Asia, particularly China. These goats have a courser outercoat and a fine undercoat, which is the cashmere. A goat only yields about 4 ounces of cashmere per year. This small yield combined with the time intensive process of dehairing it accounts for its high price. Goats are social animals with a normal life span of 10-12 years and a gestation period of 150 days. Cashmere is the fine undercoat combed from a goat, most often from its belly. It has extremely soft handle and no crimp. Cashmere has a micron count of about 11-18. It ranges from 1-3 inches, although usually closer to 1-2 inches. Most cashmere under 15 microns is too short to be suitable for handspinning. It produces a extremely fine, sleek yarn with an elegant drape. It is less elastic than wool and has very little grease content, usually about 0.5%. Cashmere can absorb water more quickly than wool and is very receptive to dyes. Cashmere is various shades of white, brown and beige. Wholesale samples packages are $25. If you want a sample package or information about our fibers, email us at info@weavercreekfibers.com. In your email, please include your company name, contact information including email address and telephone number, the nature of your business and your seller's permit number.